If you need help paying for medication, and have a low income you may qualify for extra help. If they quality, this program helps pay for their prescription drug program costs, such as premiums, deductibles, and coinsurance. 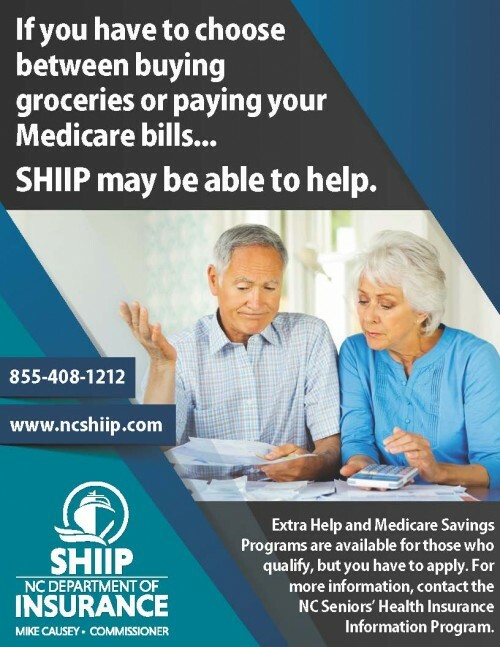 In partnership with the N.C. Dept. of Insurance, CAAA works with individuals who are either on Medicare or know someone who is to ensure they are aware of the multiple benefits associated with it. Centralina specifically conducts community training events promoting awareness of the Part D program and “Extra Help” to people on OR soon to be on Medicare. If you or someone you know pays more than $7.00 per month for a prescription drug, and you have a low income, you MAY be eligible for Extra Help from Social Security. 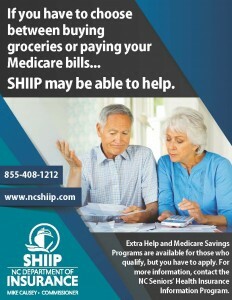 Click here for the SHIIP coordinating site list link. All SHIIP volunteers are neutral and do not sell or promote any products or services. They give individuals facts, based on individual circumstances to allow people on Medicare the best possible choices when selecting the products and services offered. All people with Medicare should know how to protect themselves from potential fraud and abuse. Over 60 Billion dollars a year are scammed from the program.